A tiger died under mysterious circumstances at the Bandhavgarh National Park in Madhya Pradesh in India recently. The 14 year old tiger was found in an injured state in Ghunghutti region bordering the tiger reserve and died while being transported to the national park. Witnesses said the tiger had sustained deep wounds that appeared 15 days old. A park official had tranquilized the tiger and it was being transported to Tala range of the national park, when it died. A source said that the tiger’s stomach was almost empty and it probably might have died of either starvation or a combination of old age, starvation and the tranquilizer. The tiger had not eaten anything for the last many days and it may not have been able to withstand the tranquilizer. The question is where are the safety measures while transporting tigers to some other place? Where are the millions of dollars, spent in the name of tiger conservation? 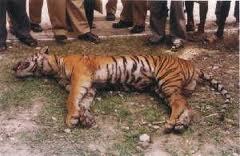 As if poachers were not enough, now the tranquilizer gun is emerging as another killer of the majestic tiger! This shows very poorly on tiger conservation in India. It is very clear and apparent that the Wildlife Gods in India are simply not bothered about saving tigers.